The All Abilities Cricket Carnival may not be the most widely known Cricket event in Australia, or even in Geelong (where its held) but its an important event, giving disabled Cricketers the opportunity to compete at the highest domestic level. 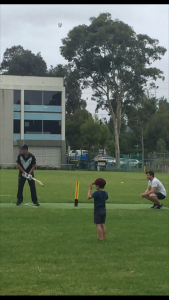 Excited about the Tournament, the Victorian Blind Cricket Association (VBCA) reached out to us just before Christmas looking for a warm-up game, even if it did involve The Quokkas. They must be really very excited. Would this rag-tag bunch be up to the task of pushing the VBCA to higher levels of performance? No. Would they create a dent in the free snags put on by the VBCA? Yes. Keeping his coin toss record in place, The Rev informed the team they were being told to field and so they ambled out to populate the oval as sparsely as only 6.5 people can. I won’t comment too much about the opening bowlers / rollers, but the top 3 batsmen for the VBCA all retired with scores of 14, 37 and 12 in pretty quick time. Maxy started to sulk, and with good reason. Cousin Sean was very tidy behind the stumps though, and 3 sharp run-outs were executed after the midway point of the innings. Rainesy then followed with a wicket and the last ball of the 20 overs saw Sean taking a good catch that came off the top edge. Exciting stuff. 117 was the target for The Quokkas, which had been helped along by 18 very generous extras. This was always going to be tough, particularly without Maxy who finished his Twisties and left in search of better role models. Monty and Rainesy made a strong start to the batting innings, scoring 6 off the first, but this is the point that the wheels started to fall off. Monty was given LBW to a ball that hit his foot that was planted firmly outside the leg stump (proper Pub Cricketer, Monty). Yvette came in and played proper straight drives, which was impressive but probably not the shot for Blind Cricket and she was eventually bowled by one that went under the bat. Dave put his beer down and wandered out to the middle for a bit, but he too was undone by the lack of bounce and was bowled for an egg. I recently discovered that a good person to help fix a cars headlights was Roley, so hoped that he could do the same with the wheels on a batting innings, and it almost turned out to be true. Roley and Rainesy started to put on a clinic, constructing a partnership of 38, with Rainesy taking the lead; hitting drives to the boundary through cover and forcing his partner to run twos. Roley was also showing some nous, opening up his bat face and hitting the ball like a sand wedge for some entertaining ‘popped’ balls. The running was obviously getting to him though and he was eventually run out for 12. This brought The Rev to the crease, which Rainesy obviously wasn’t too keen on as he started hitting out and soon got out (bowled) for a team high 32 runs. The Rev wasn’t done though and kept up his seasons record by running out Cousin Sean for 4. At least it wasn’t a duck. Or a diamond one. Monty and Yvette then both had second chances to help round out the overs, but it wasn’t enough, The Quokkas all out for 79. Many thanks to everyone that filled in on the day, thanks also to the VBCA for the chance for the game and best of luck to them at the All Abilities Carnival.